Calling all Halloween enthusiasts! At Beistle, it’s never too early to start talking about Halloween. In fact, we talk about it all year! There’s only one Mistress of the Dark. 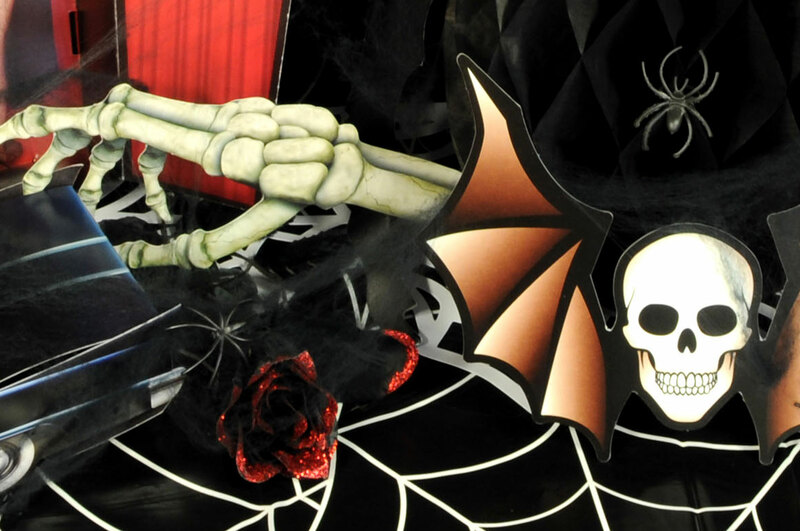 She is the ‘Queen of Halloween’ and has been featured in a number of movies and television shows. She represents spookiness, creepiness and all things scary. 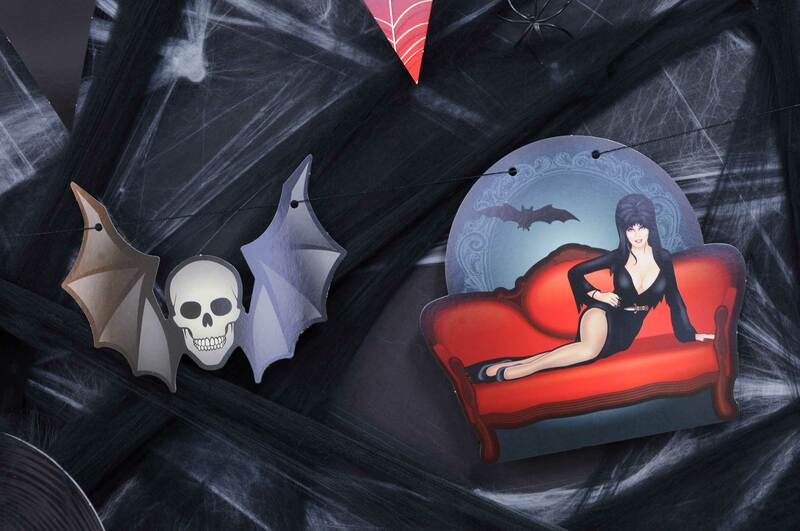 Elvira’s iconic look can be found on clothing, life-size stand-ups, collectables and even party supplies. 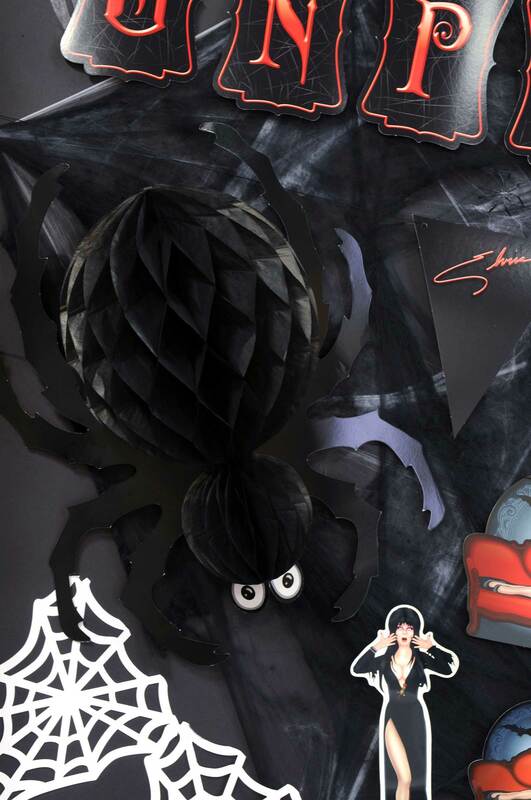 For the background of the display, I used our smaller white Spider Webs, overlaid with a Giant Black Spider Web. I’ll admit – when I first took these out of the packaging to use, I was a bit skeptical of how I was going to get this to look. BUT, as I began pulling them apart to create a look that was more web-like, I withdrew my skepticism and it turned out looking awesome! Check out the three Streamer options for this collection. The top one is our Unpleasant Dreemz Streamer, the middle is the Elvira Pennant Streamer and on the bottom is the Elvira Queen of Halloween Streamer. I love all of them, but I have a favorite…do you? The Glittered Black Roses pair nicely with the overall Elvira look. I laid them on the table, but you could also stand a single stem in a vase or group them together to create a bouquet. 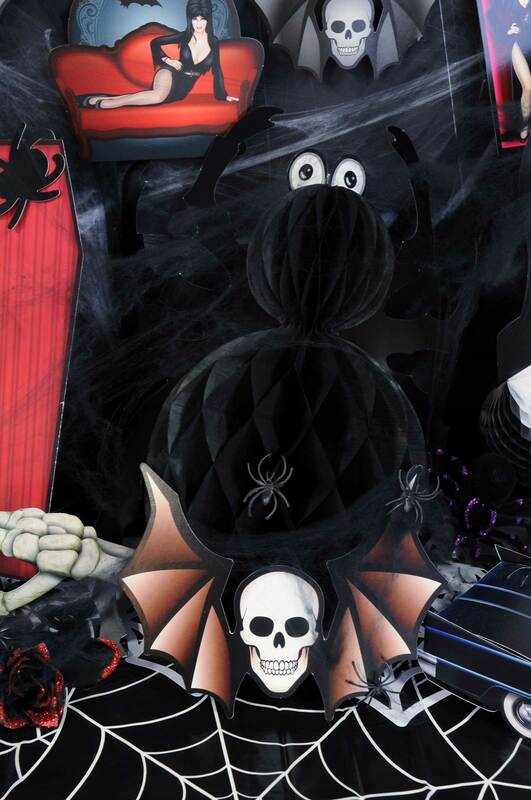 Also, don’t overlook the Spider Web Tablecover! This is a must-have for any Halloween related event. It works great on the table, but it would also be really cool on the wall as a backdrop for photos! How cool are these Black Tissue Spiders? I had never actually seen one of these out of their packaging, but they are really, really neat! 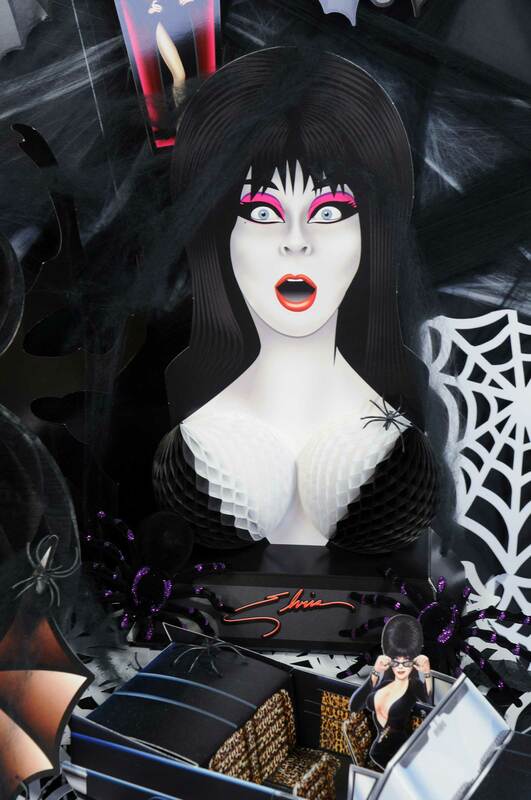 If you thought the other Elvira decorations were cool…check this out. 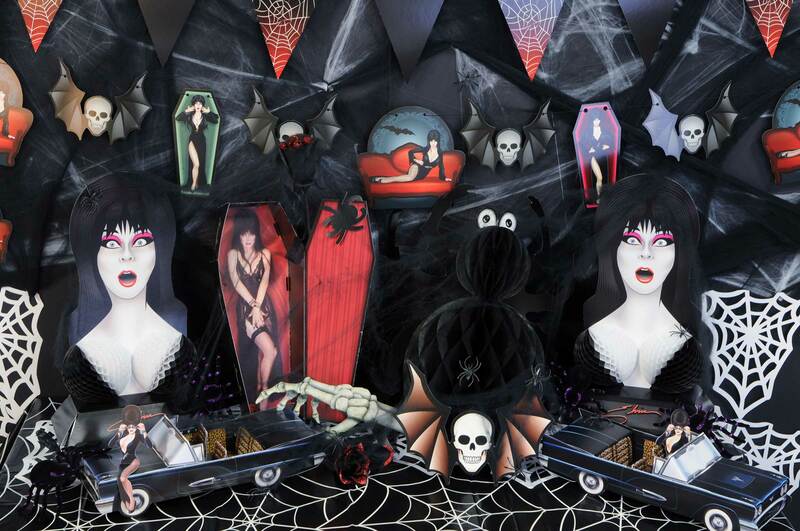 The Elvira 3-D Macabre Mobile Centerpiece is absolutely amazing. Really, i’m not just saying that. The details in the car and the overall paper engineering that the artist came up with to get this look is extremely impressive. The centerpiece comes flat and the customer simply follows the directions on the packaging to bend & fold the paper to create the car. 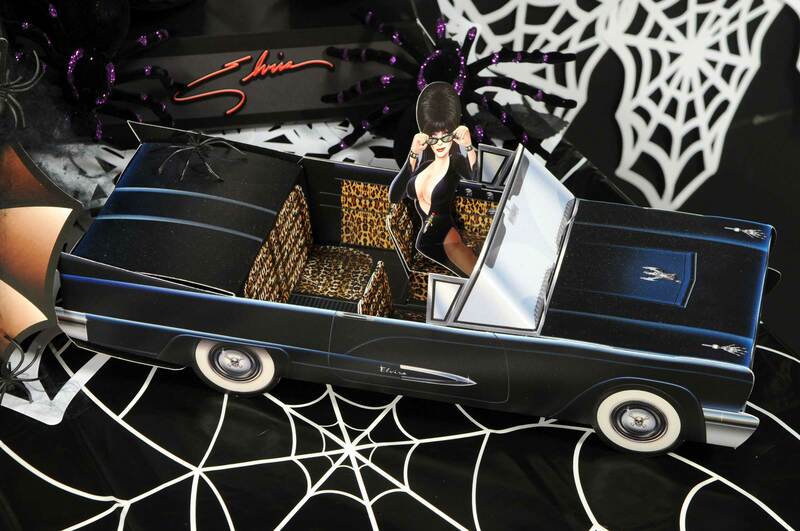 You then have the option to have Elvira sitting on the seat of the car or on the hood. Love those cheetah print seats! Last, I wanted to tell you how I created the white, spider web banner that you see in the image below. I simply took our Die-Cut Spider Web Pennant Banner, removed the ribbon, trimmed the top edge of each pennant, and linked the individual sections together at the corners. 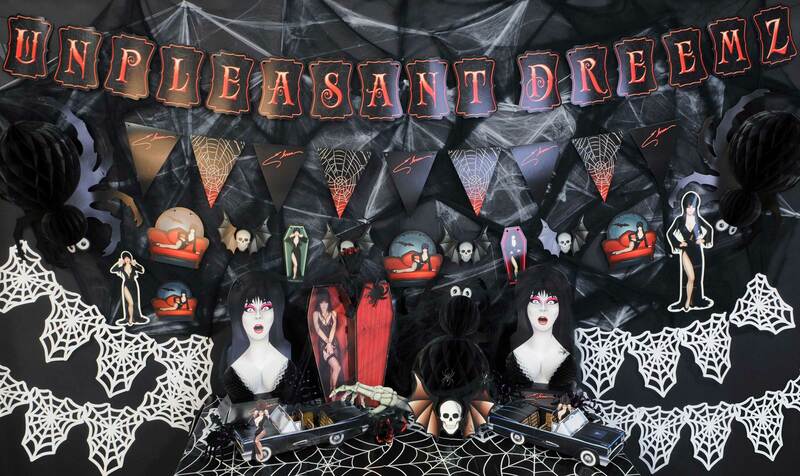 If you’re a fellow Halloween enthusiast, you’ll definitely want to check out www.partycheap.com and check out the ‘Halloween’ section. (Don’t forget to use your exclusive coupon code found on my “Shop” page). 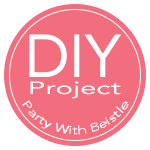 Use this blog post as a base to get inspired and be creative with our items. If you have any questions about the products used, don’t hesitate to ask! We’d love to hear from you. Where is the preorder! I want it all! I just died. I saw some up and bought them! Hi Eddieray66! Thank you so much!! You can find some of our Elvira items at http://www.partycheap.com. There are a few items that are not loaded to the website yet, but they should be up in the very near future. Be sure to check back to see the rest of the collection! This is SUCH a fun collection! So many possibilities for Halloween parties. THIS is so incredibly spooktacular! Awesome work! Kaci, thank you again for reaching out to us via our contact form on the website. I replied to you using my work email. Were you able to receive my reply? Thanks!